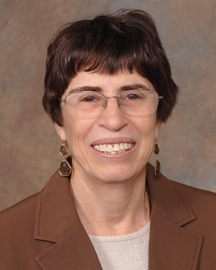 Nira Ben-Jonathan, Professor of Cancer and Cell Biology, received her undergraduate degree from Tel Aviv University in Israel and a Doctor of Philosophy Degree from the University of Illinois. She was a postdoctoral fellow at the University of Texas and a faculty member in the Department of Physiology at the Indiana University Medical School; she joined the University of Cincinnati as Professor in 1992. The Ben-Jonathan laboratory is involved in three major lines of investigation. The first is to examine both genomic and non genomic effects of estrogens and xenoestrogens on gene expression and cell proliferation in pituitary and breast cancer cells. The second, to investigate the role of prolactin, produced in human breast tissue, in the promotion of breast cancer via its actions as a mitogen and an anti-apoptotic agent. The third is to use animal models, cell lines and human tissues to determine the regulation of prolactin gene expression in adipose tissue and analyze its metabolic/endocrine functions as pertains to the control of lipolysis and adipokine production and release. Research Interests: Control of prolactin, LH and GH synthesis and secretion; posterior pituitary hormones; catecholamines in the hypothalamo-pituitary-ovarian axis; fetal/neonatal development; axoplasmic transport; dopamine receptors; tyrosine hydroxylase; serotonergic systems; electrophysiology of pituitary cells; purification of neuropeptides; immunocytochemistry and in situ hybridization; cell proliferation and differentiation; regulation of prolactin gene expression; role of prolactin in breast and prostate cancer; environmental estrogens; bisphenol A; immediate early genes; distribution and regulation of estrogen receptors; transgenic mice; human prolactinomas; heparin-binding growth factors; angiogenesis in the pituitary and breast cancer; liposarcoma; prolactin in adipose tissue; prolactin in obesity; non-genomic actions of estrogens and antiestrogens; metabolic actions of prolactin; lipolysis, adipokine release, chemotherapeutic agents; insulin; dopamine receptors in adipose tissue and breast cancer; drug discovery in breast cancer; placental lactogen; effects of antipsychotics on adipocyte functions; dopamine receptors in head and neck cancer. 1981 -2008: Editorial Boards Endocrinology; Neuroendocrinology; Biology of Reproduction; Pituitary.